Blake and McBryde initially described this injury. Floating knee is a flail knee joint resulting from fractures of the shafts or adjacent metaphyses of the femur and ipsilateral tibia. Floating knee injuries may include a combination of diaphyseal, metaphyseal, and intra-articular fractures  . The fractures range from simple diaphyseal to complex articular types. This complex injury has increased in proportion to population growth, number of motor vehicles on the road, and high speed traffic. Although the exact incidence of the floating knee is not known, it is an uncommon injury. The ‘floating knee’ is a serious injury. Floating knee injuries must be included in assessment and treatment protocols for patients with polytrauma. Damage to the vessels (mainly the popliteal and posterior tibial arteries) and lesions of the nerves (eg, peroneal nerve) are common. Vascular injury is common and may be limb threatening if not recognized and addressed. Often, the vascular injury is to the anterior tibial artery and does not result in ischemia and is not treated with vascular repair or reconstruction. However, vascular status needs to be assessed and addressed as appropriate. Traction usually causes neurapraxia, which often resolves, but complete resolution cannot always be anticipated. The incidence of open fractures is high, approaching 50-70%, at 1 or both fracture sites. The most common combination is a closed femoral fracture with an open tibial fracture. Simultaneous skeletal disruption of two strong bones of the body almost always occurs following high-velocity impact. The ipsilateral femoral and tibial shaft fractures and knee ligament injury appear to be part of a continuum of combined injuries resulting from complex, high-energy forces. The most common pattern is an open tibia and closed femur fracture. This injury may be associated with multiple remote organ damage that may range from head injury to foot fractures. The soft tissue trauma is usually immense and most of the patients are hemodynamically compromised. 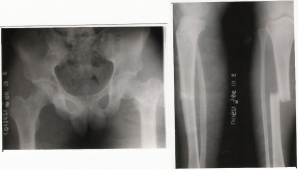 In skeletally immature patients, floating knee is uncommon. Few studies of this injury have been conducted in children. Data from available studies show that findings observed in children are comparable to those in adults in terms of the mechanism of fracture, the incidence of associated major injuries, and the complexity of treatment. Epiphyseal injury can adversely affect open growth plates, predisposing a child to limb-length discrepancy and angular deformities. Rates of infection, nonunion, malunion, and stiffness of the knee are relatively high. These complications can lead to functional impairment and frequently cause unsatisfactory results. Early reports favored a non-operative regime. Floating knee is a complex multisystem injury and soft tissue damage to the affected limb is extensive. The need for early mobilization was recognized, but the fixation techniques did not provide the desired stability to do so predictably. The surgeons preferred life over limb. The current recommendation for floating knee is surgical stabilization of both the fractures. There are a number of methods to do this and there is no single ideal technique.The surgical sequence should be individualized for each patient and each fracture should be addressed according to its personality.The chosen method depends on the fracture pattern, location of the fractures, the soft tissue injury, available resources, surgical capability and preference. The impact of the osteosynthesis technique on the overall physiology of the patient should be kept in mind. After surgical stabilization of the fractures, the knee should be examined for range of motion and stability. Collateral ligament laxity is best managed by bracing for 6 weeks. Reconstruction of the injured ligaments is usually delayed until adequate rehabilitation of the skeletal injury. The patient should have regained a good range of knee movement. Adequate pain control in the early postoperative phase by an epidural catheter or systemic opioid infusion is mandatory. Weight bearing is delayed in Type I pattern till callus is visible on the radiograph. In Type II variants, weight bearing is permitted only after 10 weeks to guard against subsidence of the articular fragments. Regardless of the injury pattern, the probability of optimum outcome is dependent on early mobilization of the knee. This is even more imperative with an intra-articular fracture. Floating knee injury is an indicator of severe trauma. Damage to remote organs should be suspected and systematically sought for. Following standardized resuscitation protocols, early stabilization of the fractures and aggressive postoperative rehabilitation offer the best chance of an optimum outcome. ↑ Rethnam U, Yesupalan RS, Nair R. Impact of associated injuries in the floating knee: a retrospective study. BMC Musculoskelet Disord. 2009;10:7. [Medline]. ↑ Veith RG, Winquist RA, Hansen ST. Ipsilateral fractures of the femur and tibia. J Bone and Joint Surgery. 1984; 66-A(7):991-1002. ↑ Omer GE Jr, Moll JH, Bacon WL. 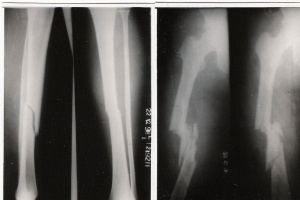 Combined fractures of the femur and tibia in a single extremity: analytical study of cases at Brooke General fckLRHospital from 1961 to 1967. J Trauma1968;8:1026 -41. ↑ Van Raay JJ, Raaymakers EL, Dupree HW. Knee ligament injuries combined with ipsilateral tibial and femoral diaphyseal fractures: the "floating knee". Arch Orthop Trauma Surg. 1991;110(2):75-7. [Medline]. ↑ Lundy DW, Johnson KD. Floating knee’ injuries: ipsilateral fractures of the femur and tibia. J Am Acad Orthop Surg. 2001;9:238–45. ↑ Salter R, Simmonds DF, Malcolm BW, Rumble EJ, Mac michael D, Clements N. Biological effect of continuous passive motion on healing of full thickness defects in articular cartilage. 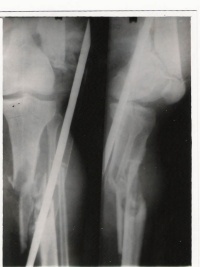 J Bone Joint Surg Am .1980;62:1232–51.